Great News for Thunderbolt NAS fans! We are pleased to update you with new on the much anticipated QNAP TVS-X82T Thunderbolt 2 and 10Gbe Range. These units are Now Available, however stock levels from QNAP themselves are very low. If you wish to get your hands on one of these units we would recommend you place your order with us as soon as possible. Built-in M.2 SATA 6Gb/s slots & 2.5” SSD slots Qtier technology and SSD cache enable 24/7 optimized storage efficiency The Network & Virtual Switch app assists network traffic distribution, and re-routes dedicated bandwidth for diverse applications Triple HDMI output (including one HDMI 2.0) for smooth 4K video playback Thunderbolt™ 2 (20Gbps) and 10GbE dual network for on-the-fly video editing and speedy sharing 4 available combinations with Mac/PC and JBOD for flexible attaching, sharing and expansion Scalable up to 448 TB with the Thunderbolt™ 2 storage expansion enclosures TX-800P/ TX-500P Virtual JBOD (VJBOD) allows to use QNAP NAS to expand the TVS-1282T’s storage capacity Supports QPulse™ unified remote server management, QvPC technology, virtual machine and container applications, and storage for virtualization * Requires OS X El Capitan 10.11 (or newer). Perfect storage trio: tiered storage, application-based partitioning & network traffic distribution The advanced hardware design of TVS-882 can facilitate optimized storage deployment based on different usage scenarios. Tiered Storage QNAP’s Qtier Technology empowers the TVS-882 with Auto Tiering that helps continuously optimize storage efficiency across PCIe NVMe SSD, M.2 SSD, SSD and SATA drives. With Auto Tiering, the TVS-882 can automatically move frequently-used "hot" data to high-performance storage tiers and less-accessed "cold" data to lower-cost, higher-capacity drives, making the TVS-882 an extremely efficient shared resource. Businesses will no longer have to invest heavily in expensive Flash technology, but can still enjoy exceptional application performance and cost efficiency from Auto Tiering with the TVS-882. CPU: 1 x 9 cm fan Designs and specifications are subject to change without notice. Great News for Thunderbolt NAS fans! 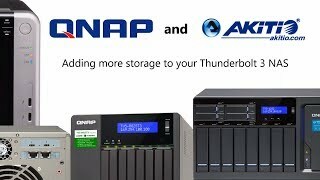 We are pleased to update you with new on the much anticipated QNAP TVS-X82T Thunderbolt 2 and 10Gbe Range. These units are Now Available, however stock levels from QNAP themselves are very low. If you wish to get your hands on one of these units we would recommend you place your order with us as soon as possible. If you require HDD, SSD or m.2 SSD installed in your unit, please let us know and we can discuss adjusted prices for you as well as include storage installation, upgrade all firmware to their latest versions pre-shipping and build any and all RAID levels for you – at no additional cost! Read more about Qnap TVS-1282T-i5-16G auto tiering. If you buy this Qnap Desktop NAS 10GbE+TB2 and hard drives we do free build and test for the unit and hard drives. So you can use this device straight out of the box. All free of charge in TVS-1282T-i5-16G price. When running out of hard drive capacity on the Qnap, TX-500P provides an easy way to immediately scale capacity up to 40TB by additional 5 hard drives. The RAID volume on the Qnap Desktop NAS 10GbE+TB2 can be expanded directly without having to reformat the existing hard drives, ensuring it continues its service during the capacity expansion. When running out of hard drive capacity on the Qnap, TX-800P provides an easy way to immediately scale capacity up to 64TB by additional 8 hard drives. The RAID volume on the Qnap Desktop NAS 10GbE+TB2 can be expanded directly without having to reformat the existing hard drives, ensuring it continues its service during the capacity expansion. Why do the prices of the NAS units fluctuate so much? This is largely due to two reasons. Firstly the newer 2017 built NAS releases (old and new device that are constructed after Jan '17) are subject to higher manufacturing costs and the disparity in the price is because of old units and newly built units in the range being bought/sold with the same %, but the base price changing. The second reason is because older ranges are being cleared when a new unit is about to be released or just arrived. That comes down to a NAS brand wanting to push their new device. In theory you can, if you had the technical "know-how" but this would void any warranty or support and we would highly recommend not doing that. Thunderbolt 2 is what it stands out with and i5 processor is half way to be the best.